The world's human population now exceeds 7.5 billion, but all those people are not distributed evenly over the available land. For instance, fewer humans live in deserts than along coastlines, and more people live in cities than in rural areas. You get the idea. But what might come as a surprise is that there is one geographical area on a two-dimensional map about 5,000 miles (8,000 kilometers) in diameter where over half of us live. This is actually nothing new. It's thought that in the year 1000, human population distribution looked very much the same as it does today, with most people hanging out in relatively small geographical areas in Asia — although the continent's population was less than 300 million instead of more than 4 billion, as it is today. But in 2013, a Reddit user called "valeriepieris" created a visual that took the internet by storm. Valeriepieris, a teacher named Ken Myers, observed and verified that more people live inside a circle comprising 21 nations — including China, India and Southeast Asian countries — than live outside it. Not only does the circle account for just a sixth of the world's landmass and include Mongolia, one of the most sparsely populated countries in the world, but it is also mostly covered in water. The Valeriepieris circle made a splash on Reddit and was picked up by multiple news outlets, including The Washington Post in its article "40 maps that explain the world." But how accurate is Myers' projection? 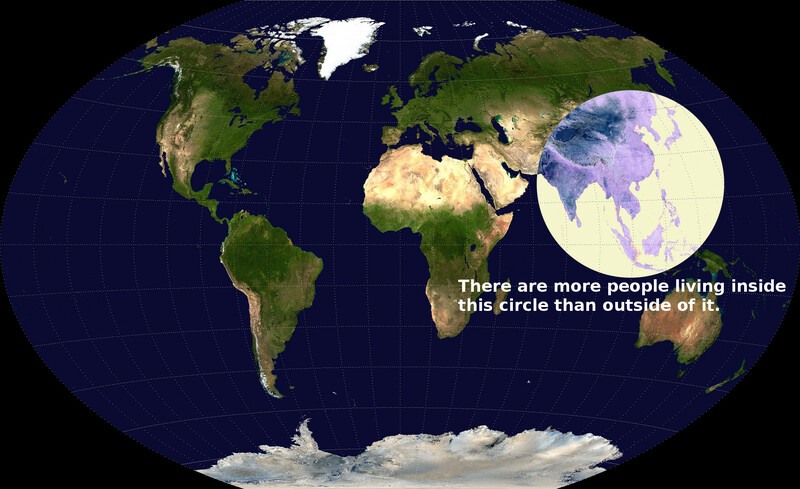 In 2015, Danny Quah, a professor of economics at the London School of Economics and Political Science, tested the Valeriepieris circle to see if Myers correctly estimated the size and positioning of the circle that holds over half the world's population. Quah used a different mapping projection and asked a slightly different question than Myers: What's the smallest circle on Earth with more people living inside than out? Although Quah ended up moving the circle over a bit to exclude most of Japan, he conceded in a blog post that "Ken Myers nailed the key idea." In 2015, back when the world's population was just 7.3 billion, it was estimated that every living human could stand (really closely together) in an area of land the size of New York City.